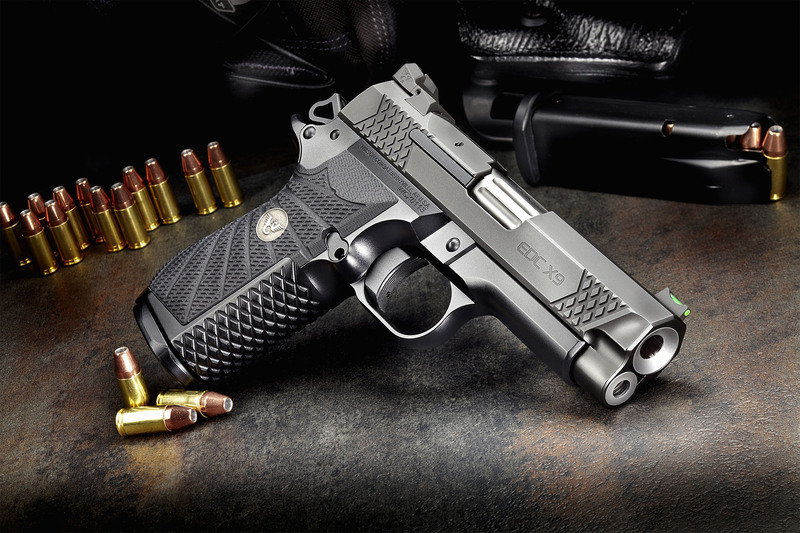 Wilson Combat has always been at the forefront of 1911 design but this rethinks it from the ground up. The new EDC X9 is a modern, alloy-framed, double-stack 9mm service pistol built from the ground up for everyday carry. Would John Browning be impressed? Wilson Combat certainly hopes so. Chambered for 9mm Luger, the EDC X9 has a 15+1 capacity while retaining the same grip geometry of a compact .45 ACP 1911. It is a single-action pistol with a light, 4-pound trigger pull for accuracy. 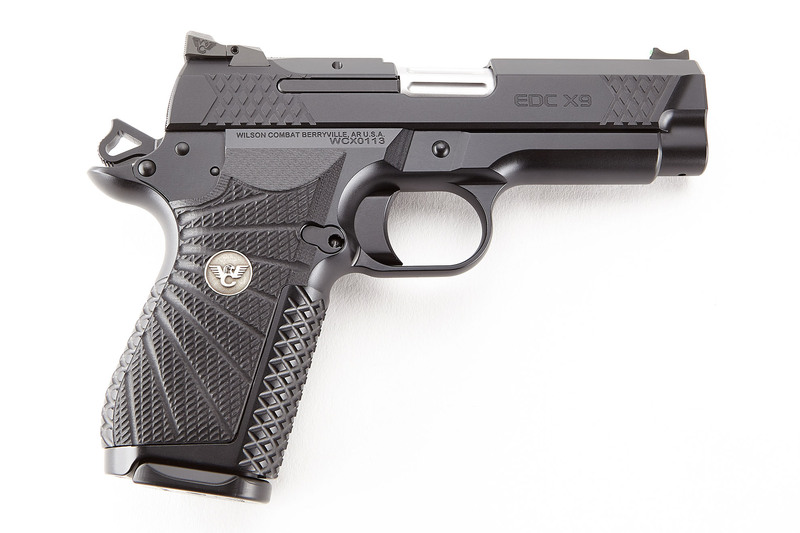 Wilson Combat guarantees that every EDC X9 will produce 1.5-inch groups at 25 yards. It achieves this thanks to a fluted match-grade barrel and target crown. Gone from the EDC X9 is the 1911s famous — and contestable — grip safety. Grip safeties are of one the biggest points of controversy when it comes to 1911s. The EDC X9 replaces it with an all-in-one mainspring housing and screwless grip panel assembly. Other modern touches include front and rear cocking serrations, external extractor and adjustable low-profile fiber optic sights. See Also: Dan Wesson ECO – The Perfect EDC 1911? 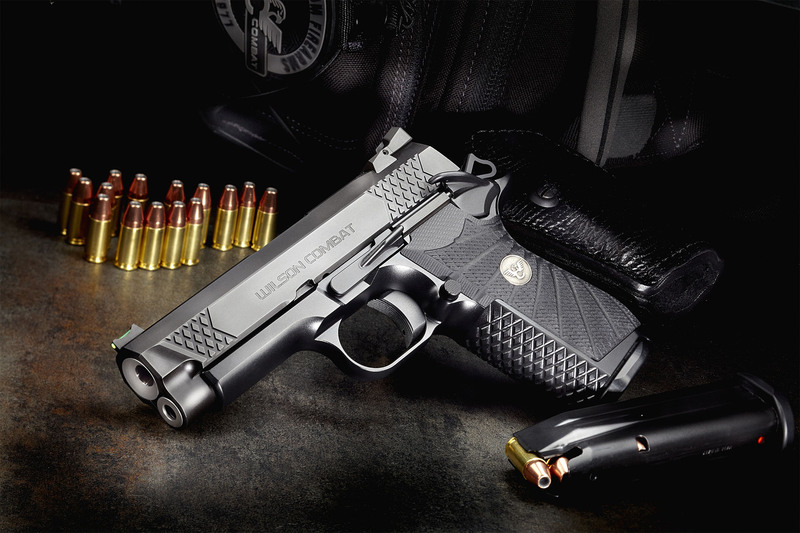 Wilson Combat uses enlarged and extended controls, including the safety, magazine release and slide stop. The manual safety is on the left side and the grips have cutouts for left- and right-side safeties. The grips feature Wilson Combat’s signature starburst pattern with pewter medallions. All of the checkering including the slide serrations and front- and backstraps use Wilson’s diamond X-Tac pattern for looks and leverage. The pistol has an enlarged trigger guard for use with gloves and comes standard with a medium-length radiused trigger. It’s a snag-free design without a railed dust cover and a short beavertail grip. Overall the pistol measures just under 7.5 inches long, 5.25 inches tall and 1.4 inches wide at the controls. Dry, the gun weighs 29 ounces, which makes it great for all-day carry just about anywhere. It has a 4-inch barrel which is standard for the majority of service pistols and comes with two 15-round Mec Gar magazines. If there’s one thing about the EDC X9 that shouldn’t come as a surprise it’s the leading-edge price tag. 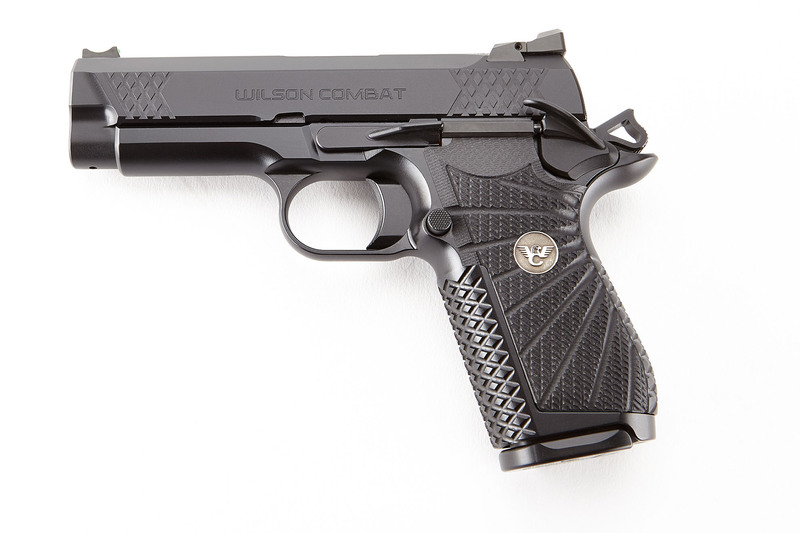 Wilson Combat is taking orders for the pistol for $2,895. Still, this is a new, flagship model and more affordable models could be in store down the line. We don’t expect to see guns competing with mainstream service pistols but something a little more approachable would do well for Wilson Combat. Previous post: That Gun Isn’t ‘Too Expensive,’ It’s Only Too Expensive For You! For those that don’t want the X9 for all the reasons stated, that means that the waiting list for this overpriced pistol may drop down to under a year to get one. There are sufficient folks lining up to make the wait. Oh boy another rich boy toy. Even if I had the coin I just don\’t like to over pay, I like value. Lots of great 9mm guns out there, I love the 1911 but as 9mm carry gun? well for 2800, no thanks. This pistol is a solution to a non problem. The 1911 is a timeless design perfect just as it is. If U can afford this gun (Yes I can BTW.) good for U. If U actually spend that kind of money on this thing well that would be Ur problem. WC has strayed far and wide of the path on this one. OK people, just state the truth. The pistol isn’t too expensive….it’s just too expensive for YOU. If someone were to give you one, you’d go around to all your buddies and brag about it. You pay for quality…and NO, your cheap under $600 1911 can’t even come close to the build quality or reliability of a weapon like this. With respect, it’s not too expensive for me by a long shot (see what I did there?). What I take issue with is any defensive carry gun that cannot be racked by simply snagging the sight on your belt / pocket / heel, etc. It’s a design oversight (sorry, but I’m on a roll here) that Wilson will correct. Look at the sight profile of the PPQ, the Sig 320, and even the Glock 19 for reference. Don’t like the sights, change it. How many people in this world has ever had to use a sight to rack the slide? Even when you do it to act tacticool, the round probably has a bigger chance of a misdeed than using some other method. I prefer to put one in the chamber before my arm gets shot off and then I just use the slide release since it stays open on the last round. I think the EDC X9 is a very nice looking firearm but over priced. I am partial to .45 but that said, today’s new 9mm ammunition satisfy’s the masses. The 1911 firearm will always be my preference but maybe just a Nam nostalgia. James, must agree with you, it must be a Nam thing. I just purchased a Remington R1 1911 45 ACP. I will always say it was and is and will be the best pistol ever made. By the way Welcome Home Brother. 68 – 69. It satisfies the masses, too. I own 4 STI’s 3 are 2011’s from Cmdr to Full Size and one standard 1911 officer size in 40 and 9mm. Also a Para 14-45 3 Sigs in 9mm P226 and P299. Owned a M9 for 30 years and I have been shooting 1911’s for 35 years. Note here, the only reason I mention the collection is to show I own them and have the hands on time to make my point. I know I will be bashed for this BUT that is what I am looking for as I want to hear others opinions on this. I love my 1911\2011s but my hands are getting “old”. The One thing I like about my Sigs Over my 1911’s is the ability to simply Lock the Slide Back then Rotate the Lever and Slide the Barrel Off. Why can’t ALL the Above be incorporated but ADD this to the 1911 Also? Go Ahead and Bash Away OR Simply give some well thought out reasons. Well, I’ve always sat back and read, but can’t help posting on this one. Not going to say anything good or bad about the gun itself. But regards the ongoing comment about “you get what you pay for”…While a very true statement, it doesn’t alter the fact that when something is overpriced, then why over-pay for it, and it could be a good idea to pursue other options, and still have a fine shooting pistol and $1,500. or so left over. With that said, just because someone can afford this pistol doesn’t change the fact it is overpriced…period! Is Wilson Combat a subsidiary of the PT Barnum group? Taking orders for a short-barreled 9mm 1911-pattern pistol at $2500.00 a go? I guess that means us poor slobs will have to make do with the plethora of 1911-pattern 9mms already on the market; some for under $600.00. I have an ancient Star 9mm 1911-pattern with a 5-inch barrel that makes nice two-inch groups at 15 meters when supported. The ejector needs replacing but it works and only cost me fifty bucks when I bought it. Don’t shoot it much (ejector, remember?) but it works and doesn’t have a grip safety either. My point: Yes, it’s nice that someone is making another 1911-pattern handgun. What isn’t nice is the price for what is essentially a concealed carry piece. If it were competition, I could understand; but as a carry piece? What if it gets lost or the police take it and decide to keep it? I think I’ll give this one a pass. I heard talk at the last ELR shoot I attended about this project. I have read comments in the past from readers about the price of high end firearms. The first handgun I could afford at the beginning of my working life was a Ruger Super Sungle Six and I paid it off in six payments. I still own and shoot that gun. Fast forward to today, I have six Wilson Combat 1911s on my CCW permit and one at their shop being built as a Barbecue gun, I look forward to getting it. If I am able to get my hands on one or two of these I will gladly pay to play. Quality costs money folks, always has, always will. Work hard and save those pennies, money spent on quality seldom disappoints. Beats cash in a bank for wealth storage. Enjoy your toys and ignore all the whiners that will reply. There was a time when I though a Colt or a Sig or a Kimber would never be in my price range. As I got older and my kids moved out and I made more money I finally came to a point in my life where I could afford them. Yeah, I have to save up. But I can do it given a little time. Don’ know if I’ll ever be able to afford one of these or not. Wilson’s are good guns. Guess if I had the 3 grand I might consider it. Who wouldn’t like to say they owned a Wilson. Or, like some others here I might consider that I can by 2 or 3 other good guns for the money. Point is; a person wants what they want. It’s up to them. If they can afford this gun and they want one then so be it. For some people it is about being able to say they own a gun like a Wilson. Guess I don’t understand all the criticism. If the gun is not for you then don’t buy it. Personally, I am hoping my next gun is a build I can do myself. That way I can purchase the parts a little at a time and build a top of the line gun. That would be the gun I would be most proud of. I’d put my own name on it. Congrats Wilson, you just built a $3000 Browning hi power. Years ago Colt made its 1911 in 9mm,don’t know when or if they stopped but my brother had one and it was a nice piece.Springfield makes both the 45 and 9mm in their Range Officer and for almost 2 grand less.Let’s face it,the vast majority of us aren’t that good where we’ll notice the difference between a high end pistol and one of more moderate cost.I’m certainly in that category and will freely admit it so when the time comes I’ll go with the range officer.I have a standard run of the mill bare bones 1911 and that for now works for me.Admit it people,you’re not good enough for a 3000 dollar gun. blah,blah,blah,blah. If you have 3k to drop on the weapon and ya want it, do it. I love 1911’s. For some of us I guess because we had them in the military. However, I can purchase or build 3 1911’s for that 3K. If the intent is for carry and home personal protection you dont need a Porsche 911 turbo when a Corvette will get the job done. I have some high end weapons and some middle of the road. If you put me in a corner, they will all make you just as dead. Good luck explaining to the grand jury how the perp made you feal threatened a 25 yards. why the change to an exposed extractor. ? ..the original extractor was easily changed by hand, without any tools…now this obsession to increase the complexity of using a 1911 design by removing grip safety, removing the 1980 series 80 trigger block, and inserting a easily fouled, difficult to replace extractor..? high price does not mean higher dependability …..
John Browning had the same 9mm, double stack magazine idea, its called the High Power. There are some very good bullets available in either caliber that will do the job that needs doing. Others are Hornady and Wilson Combat. The average performance for 18 9mm bullets tested was: 1168, 14.3, and 1.57. You decide what you think is important. Don’t for get magazine capacity. You don’t have a problem if you still have some left after the shooting is done. Stopping power is dependent on total energy transferred and that depends primarily on mass and velocity. Other criteria are secondary. Expansion for example is only important in ensuring impact energy is not lost by complete projectile penetration. It’s nice that the lessor calibers allow more rounds per magazine, but I think the need to deal with a crowd of assailants is less likely that an unjustified lawsuit following any use of deadly force. I’d rather face the inevitable lawsuit having fired a single round. I still will stick with my Springfield 1911 Stainless Steel .45 ACP and my Springfield .45 ACP XD 4.5 13+1 capacity. Knock down caliber in one shot! All a good marksman needs. Knockdown? Ummm physics says pistol bullets don’t knock anyone down. And one shot stop come on man. Let me guess you use RIP ammo too? Yes, I use RIP ammunition. What’s your beef with them — with RIP ammo? Your physics calculations will also show you that a man cannot be knocked down by a hundred rounds ad long as they are fired sequentially rather than simultaneously. Perhaps a calculation to account for sudden muscle contraction cause by massive tissue destruction and pain would be more relevant. I have a Wilson with a steel (alloy) frame. No mention is made in this article as to the type of alloy used in the frame of this new gun. Is it an iron alloy (steel), an aluminum alloy, a (heaven forbid) a zink alloy, or some unusual alloy like scandium, as used by, I think, Springfield, some years ago, but maybe not any more? As everyone knows, virtually every metal part of every gun made since Davey Crockett’s day, and maybe before, is made of one alloy or another. Very few metals in their natural, non alloyed state, are suitable for use in anything structural or functional. I think I’ll go outside and send a few lead alloy projectiles downrange this morning. Maybe we’ll address the current stupid and almost universal use of the word “polymer” next time I read an article written without research by someone on this site. Wilson, Ed Brown, Nighthawk, Turnbull, all make very fine 1911 pistols. They are expensive, however they are very accurate. A lot of people complain about the price, rightfully so, but I would bet that a lot of people posting have multiple guns…maybe even multiple $400-$1000 guns. Maybe a Colt 1911 or a Springfield, maybe a Kimber. Maybe sell some of your guns in order to purchase a high end 1911 because you will be absolutely amazed when you shoot it. You .45 guys are funny. Despite physics and medical reports you still believe large caliber has “stopping power”. It’s pure nonsensical machismo. Care to catch a few and show the world how they don’t work? What he said means “Despite physics and medical reports, people still believing that larger, slower bullets have better “stopping power” than smaller, faster bullets is pure nonsensical machismo.” He’s saying that the “bigger is always better” thought is nonsense, and that, with the right defensive bullet design, 9mm and .45 work equally well overall. Beautiful design! Wish I had money to burn. $2,900 is just a ton of money. Maybe I’ll take one of my plain slides out to the shop and try to create something similar ;). In either case, hats off to Wilson Combat for removing the grip safety and for their dedication to both form and function. $3000 and you couldn’t equip it with an ambi safety? No doubt this is a fine weapon and I’ll probably purchase one. Presenting a high capacity 9mm 1911 as something “new” is misleading at best, as Paraordnance has been producing them for decades, in both 9mm and .45 ACP. Wilson has a reputation for quality, not originality. It does not present an honest image to make a claim that most of the handgunning community knows is false. Yes, but unlike Para’s, these probably work. I’m with the working mans comment, $3000.00,, wrong group of customers! I am not impressed and I doubt if John Browning would be. A 1911 copy maybe .but an alloy frame in 9M/M is not a 1911. The price is way out of reach. I have a number of alloy frame 1911’s. They’re all made of steel, which, as everybody knows, is an iron alloy. I guess what you’re sayin is that 1911 can’t be made in 9mm. Why not? That’s like sayin it’s not an M16 if it shoots anything other than 5.56. Clearly, GA doesn’t give a f $ck about the everyman, either. If you don’t have Corporate Executive $, you can go pound sand. Would you even pick up a Road & Track magazine if the articles had nothing fancier than a Ford Focus? No, of course not. You would want to read about the newest BMW 3 series you might be able to afford, or at least save up for and you definitely want to read about latest Ferrari and Lamborghini. Most only get to drool or dream, and a few will actually buy. But don’t knock knowing about something out of your personal price range. For that kind of money I could go to a master pistol smith and have an STI carry gun built up from scratch that is easily as accurate and reliable as Wilson’s offering for half to 2/3 the money. 3000.00 !!! Damn, I\’m a working man, guess Wilson Combat does not want me as a customer. Frank, sorry to hear about your accident. I own the Rock Island Armory 22TCM/9mm combo Target 2011 which has the 17+1 capacity. Definitely not a carry gun unless you wear a very heavy belt and aren’t really trying to hide the fact that you are carrying. The 22TCM is a great round…a tad more energy then the FN Five Seven. 2000fps out of a 5″ barrel is pretty cool…especially with very little recoil. Swapping over to the 9mm is just a spring and barrel! Like you said, the slide is butter smooth. RIA has come a long way. The price on their 1911s and 2011s is creeping up every year, but the quality is there. $600 to $700 for that combo is a great value compared to $3000 for this high end WC 1911. That really is out of reach for most of us “everyman” kind of shooters. Hope you are healing up well. Safe shooting! 3000.00 !!! Damn, I’m a working man, guess Wilson Combat does not want me as a customer. It might take a while, but if one of your goals was a high end pistol, get ‘r done. Yes, THAT’s the goal – to exclude customers. BTW, Ferrari doesn’t like customers, either, but Porsche reluctantly tolerates them, although you may want to avoid them, also. I can do that with a regular M1911 from Springfield at 25 yards. I\’ve done better with that gun, and it ran south of $500 when I bought it. Used Sellier & Bellot FMJ ammo, and surplus stainless 7 round magazines, so nothing fancy what so ever. Wilson Combat makes nice guns, but this 9mm isn\’t worth even $1000, much less the ridiculous MSRP of close to three grand. Clearly, the Wilson Combat brand has lost all touch with reality. Also, without a grip safety, this is about as much of a 1911 as would be a CZ 52 or a Makarov, or a Tokarev TT. Seriously, somebody needs a dose of common sense and another dose of shame!If this gun were the last shooting pistol on Planet Earth, I\’d get a slingshot. 4\” barrel, who the hell are you fooling? The standard for the 1911 is 5\”+ and for a very good reason, since accuracy is important and determined by the barrel\’s length. Somebody figured they\’d rip off the 1911-style trigger, put it on a fancy-looking XD frame, and shoot the breeze asking for three grand for this gun. This IS NOT the next anything 1911, especially in the 9mm Parabellum. I\’m a 1911 purist and I would say an old WWII worn-out 1911 is a better gun that this POS any given day. Far as \’grouping\’ is concerned – shooting a stationary target at a determined distance is for people who don\’t train to fight, just to impress. Good shooters will challenge themselves with moving targets or discretionary set-ups. If I were back in the USMC, I would not take this as a side arm unless ordered to do so. And here it is. That didn’t take long. If it had been a .45, you’d be asking for a 9mm. Never satisfied. Ever. The gun community is whiny as hell. I can do that with a regular M1911 from Springfield at 25 yards. I’ve done better with that gun, and it ran south of $500 when I bought it. Used Sellier & Bellot FMJ ammo, and surplus stainless 7 round magazines, so nothing fancy what so ever. Wilson Combat makes nice guns, but this 9mm isn’t worth even $1000, much less the ridiculous MSRP of close to three grand. Clearly, the Wilson Combat brand has lost all touch with reality. Also, without a grip safety, this is about as much of a 1911 as would be a CZ 52 or a Makarov, or a Tokarev TT. Seriously, somebody needs a dose of common sense and another dose of shame! If this gun were the last shooting pistol on Planet Earth, I’d get a slingshot. 4″ barrel, who the hell are you fooling? The standard for the 1911 is 5″+ and for a very good reason, since accuracy is important and determined by the barrel’s length. Somebody figured they’d rip off the 1911-style trigger, put it on a fancy-looking XD frame, and shoot the breeze asking for three grand for this gun. This IS NOT the next anything 1911, especially in the 9mm Parabellum. I’m a 1911 purist and I would say an old WWII worn-out 1911 is a better gun that this POS any given day. Far as ‘grouping’ is concerned – shooting a stationary target at a determined distance is for people who don’t train to fight, just to impress. Good shooters will challenge themselves with moving targets or discretionary set-ups. If I were back in the USMC, I would not take this as a side arm unless ordered to do so. Big talk when you have champion shooters like Bill Wilson and Mike Seeklander on this video. Go get your old 1911, polish up on your immediate action drills (you’re going to need it), and post a video of you shooting as well as these champions, slick. Hell yeah! I never comment but this is definitely a win. I want one. I’m happy to hear it’s an alloy frame to. Why aren’t more manufactures making a model similar to this. And I’m not one to complain about price, you get what you pay for and if you want something you work for it. Alloy? All 1911’s that aren’t made of plastic (polymer, indeed) are made of one alloy or another. Almost everything made of metal is made of one alloy or another. My wedding ring is of a gold alloy, as are granny’s tooth fillings. The weights that balance my truck wheels are lead alloy. Same same the bullets I shoot. The parts of my truck that aren’t rubber or plastic or cloth, all the metal parts, are one alloy or another. My 1911’s all have steel frames. Steel is an iron alloy of course, as everybody knows. I wonder if this new wilson has an alluminum alloy frame, or some exotic alloy, like the scandium frames from Springfield a few years ago. Now that would be the carry gun I need, beautiful! Wilson came up with the ultimate for 1911 fans. I absolutely love your McDonalds comparison.